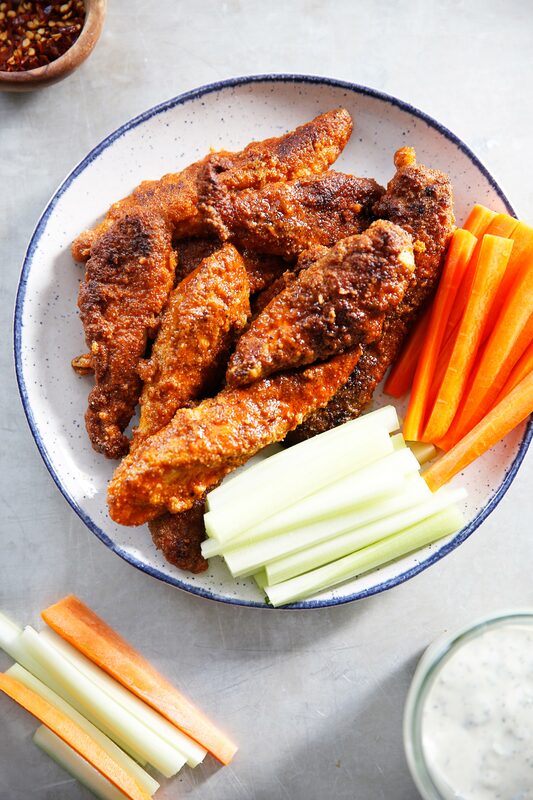 These crispy Buffalo Chicken Tenders are my new favorite healthy buffalo chicken tender recipe ever. Golden brown, perfect touch of spice, crispy, and totally gluten-free, low carb, and paleo-friendly! 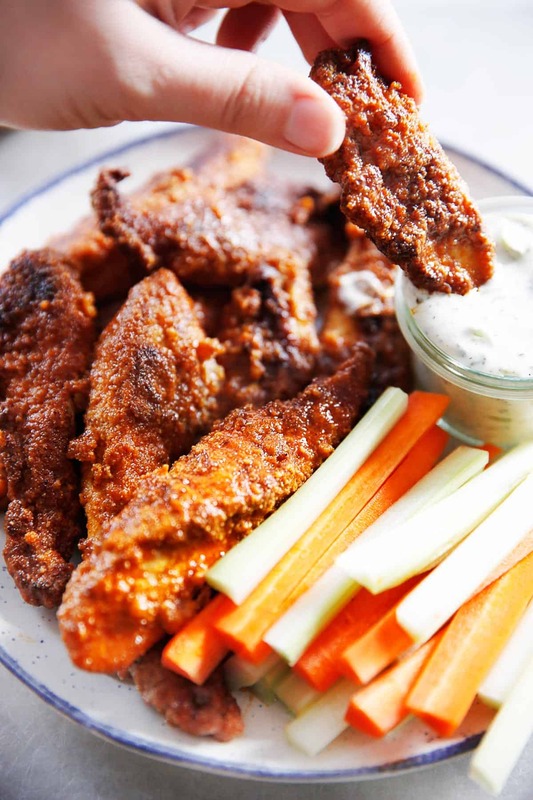 I serve these with the Ranch Dressing from my cookbook and they are a total hit every single time! Crispy on the outside, tender juicy chicken in the inside. Just how I like ’em! 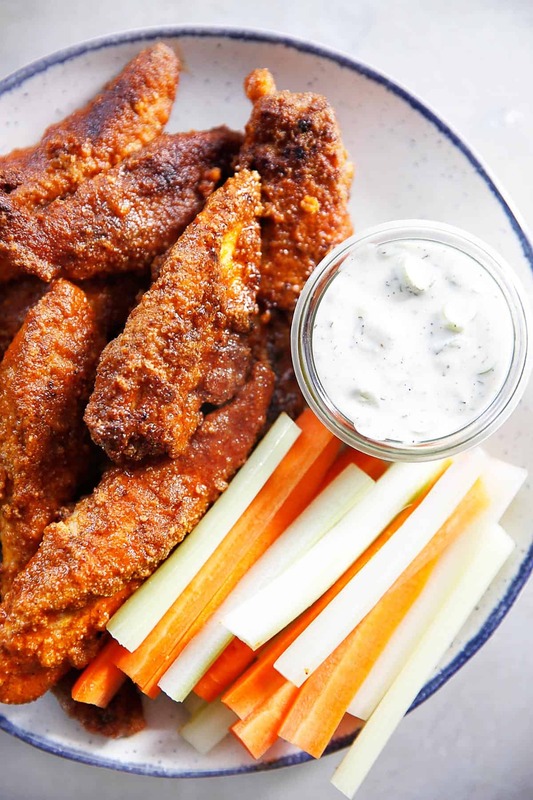 Make them for game day, a weeknight dinner, or just for a fabulous appetizer or snack! OMG. Wait… Is this overkill? I’m going to go with no. Humor me here! Cut chicken into strips if using a whole breast. Pat chicken dry and season with salt and pepper. Whisk egg with 1 tablespoon hot sauce. In a medium bowl, whisk almond flour, garlic powder, onion powder, paprika and cayenne until combined. In a large skillet, heat avocado oil for 2-3 minutes until hot. In a saucepan, heat butter until melted. Whisk in 1/2 cup hot sauce and bring to a simmer. Add in chicken and toss until coated. Remove to plate and serve immediately. Perfect for a summertime party platter! Very nice recipe, thanks for sharing, i will have it in my try kitchen list. Yummy chicken tenders! Love this recipe! Thanks! Do you have a good substitute for almond flour? I’m allergic to nuts! Love this recipe. Keep posting such delicious dishes. I and my family love this tender chicken recipe. Please keep posting them. We all have become big fans . These look yummy… If gluten is not a concern. do you think I could sub Panko Breadcrumbs for the Almond Flour? How many smart points? What size is a serving? They look delicious! Can I omit or substitute the hot sauce for the little ones? Another winner for my family! These were so easy to make and with a little more practice they’ll look prettier 😂. I did leave off the buffalo sauce for my girls but they still loved them! Just made these and they were delicious! My daughter is allergic to chicken, and doesn’t care for buffalo so I followed the same recipe for her with bbq sauce and turkey cutlets, and she said they were really good! Thank you Lexi! I made these for dinner this week, and they were SO good! This is a quick and easy recipe for a weeknight meal. The spices in the breading (even before the buffalo sauce) was SO good. I highly recommend giving this one a try! I may have missed it, but has anyone calculated the macros? These look great! Can I ask what the white dipping sauce is please?! The Homemade Ranch Dressing from my cookbook! You say these are low carb which attracts people’s attention yet you fail to list any nutrition facts. What is the carb content of this recipe? Also you post says Yields: 2. Is that two servings? Feel free to enter it into any free online calorie calculator like myfitnesspal. But yes, if you look at the ingredients, you will see they are low carb 🙂 And should say serves 2, correct. What kind of hot sauce I do you use? And is it mildish? Thank you for this delicious recipe! I started low carb a month ago and these go with nearly everything. And they taste SO GOOD! I make a huge batch and even reheated in the microwave they are delish. I like them with and without the buffalo sauce, may even prefer them without. Cooking up a huge batch again today for meal prep. Thank you! Could you swap coconut flour for almond flor in this recipe? No coconut flour is never a 1:1 sub! Can you cook these in the air fryer rather than stove top? If so, what temp/time would you recommend? Does anyone else have trouble with the breading not sticking or the almond flour burning on the bottom of the pan after the first batch? I’m currently eating them and I am beyond obsessed!!! These are the best tenders I think I’ve ever had. I’m in love with how guilt free and filling they are, too. I put mine in the oven instead of frying them and they turned out great. Thanks so much for sharing this! You have to be gentle, but it shouldn’t come off. For frying? Yes! It’s better for high heat cooking. Do you have the nutrition facts, most importantly the net carb count? These were excellent, thank you! I served them atop a green salad with avocado celery blue cheese and bacon! The perfect Keto salad. These turned out really good just not pretty. Does the avocado oil cook differently than olive oil? The breaded parts were falling off when I fried. I’ll probably bake next time. And I didn’t see any macros for this?? can’t do almond flour in my house….gluten is not an issue. what are some alternative options to almond flour?? Thank you. You can use breadcrumbs in place.